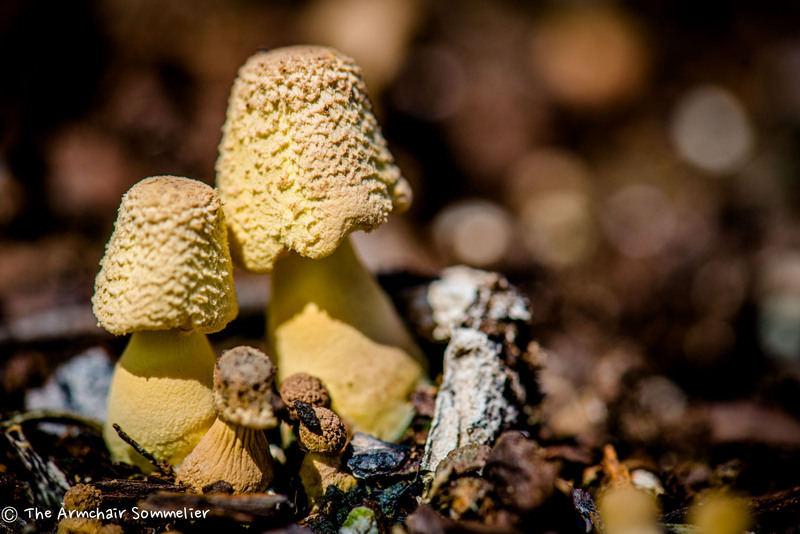 Calling all mycologists! Teeny-tiny mushrooms, of unknown variety, in my garden. Our theme for the Weekly Photo Challenge this week is: Beneath Your Feet. Our instructions: This week, look down and capture the ground beneath your feet. Earlier this week, I was attempting to do some weeding in my garden. Honestly, I don’t know why I bother — by this time of the summer, the weeds are not only winning, they’ve lapped me. I looked down, and just about stepped on these tiny little mushrooms (you could fit the whole group of them under the canopy of a dime). So I ran inside to get my camera, and my macro lens. I’ve never seen mushrooms like this before. I did a little Nancy Drewing online, but couldn’t definitively ID them (do you have any idea how many different species of mushrooms there are?). They’re probably some kind of harmless garden mushrooms. Or . . . they could be the kind of mushrooms that murder you. One never knows for sure with ‘shrooms. They look like an inspiration for the 1970s Tupperware palette, don’t they? Apparently, a person who studies fungi is called a mycologist. So, if there are any mycologists (or fungi fanatics) out there who can identify my ‘shrooms, I’d love to know what they are! Yep, that’s pretty much my rule with any mushroom . . . if I find it outside, I don’t eat it! I’m just not that confident about the whole poison – not poison thing. Salud!! Cute – they look like little thimbles on top! But, sorry, I don’t know what they are. They DO look like little thimbles!! Wish I knew what they were!! Salud!